Privileged to see several superbly curated and intelligent shows of his works, I step back and see that this is my year for re-evaluating and confronting Picasso, and learning more about his life and times. I’ve always been enticed by Picasso—but this is the year to ponder, observe, study the context, and gain new appreciation. “Pablo Picasso is still the cornerstone of the art marketplace,” said Guy Bennett, the former head of the Impressionist and Modern art department at Christie’s in London. And so this year proved, as prices held firm, and the rage for Picasso continued unabated. In New York, I spent hours at the Gagosian Gallery viewing the stunning 'Mosqueteros’ show of his late paintings. The collection, mostly from the Picasso family's private stash, exhibited the power of works crafted in his later years. In Paris at the Grand Palais, Picasso was placed with art’s grand masters. 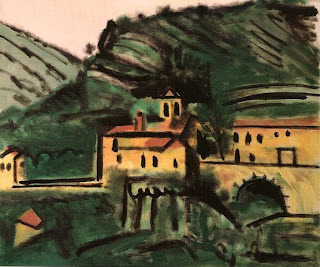 And now, just in June at the stunning Picasso/Cezanne exhibit in Aix-en-Provence—the Musee Granet and the city of Aix-en-Provence had more Picasso surprises for me. Last fall, in a conversation with an in-the-know French friend, I heard that Picasso’s Chateau de Vauvenargues would be open for viewing from the end of May until September 27, 2009. It had never before thrown open its doors to the public—and would never again. Aix-en-Provence is celebrating the artistic relationship between Cezanne (an Aix homeboy) and Picasso, I learned. 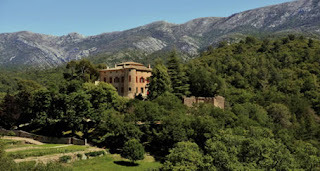 And so Picasso’s stepdaughter, Catherine Hutin, on the 50th anniversary of his arrival in the area, was generously opening the doors of the Chateau de Vauvenargues, one of her residences, to the public. 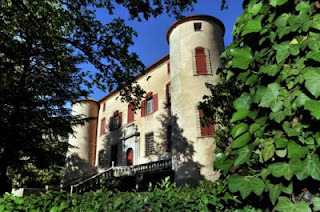 The 15th-century chateau, situated on the slopes of Mont Sainte-Victoire in the sun-struck countryside a few miles east of Aix-en-Provence, had been Picasso’s studio and residence for just a few years—from 1959 until 1961, and has always been the family’s private sanctum. I knew I had to visit. Chateau. Picasso. Provence. One time only. 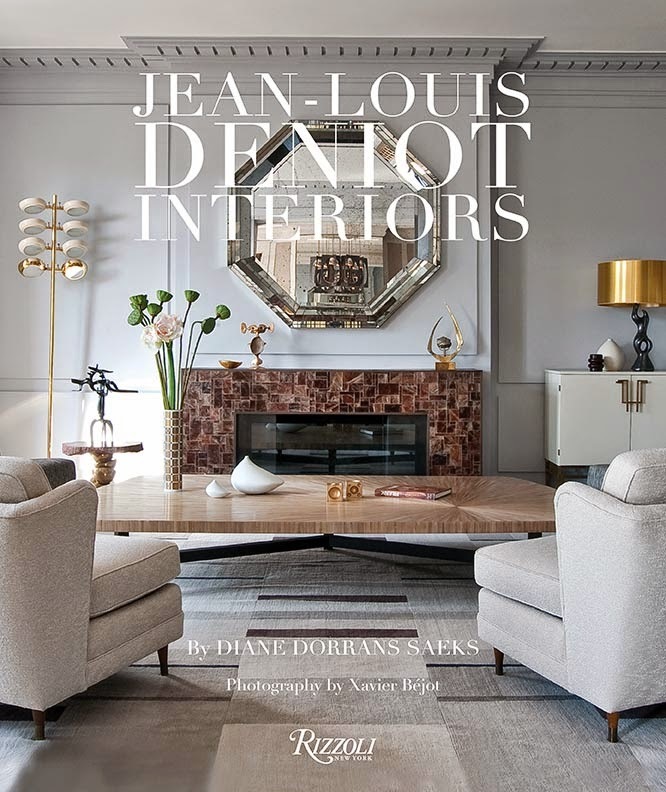 Chateau interiors. Calling Lufthansa! 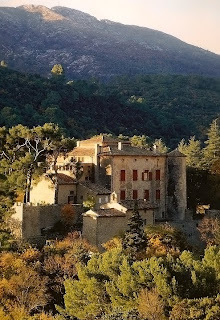 Chateau de Vauvenargues stands on the edge of the forest on the slopes of Mt. Sainte-Victoire. I learned that Picasso painted in its grand rooms, and came and went from the chateau—often paying visits to bullfights in Arles. But even the locals had never glimpsed inside the castle. 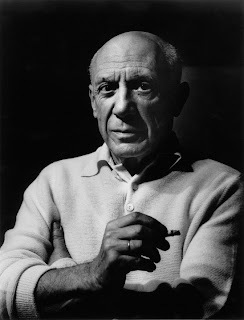 After the most prodigiously prolific life, Picasso died in 1973. He was buried in a very elegant circular plot on the chateau grounds. When Jacqueline died in 1986, she was buried alongside Picasso, with a bronze statue above, but no tombstone or marker. I took the TGV from Paris to Aix, but by the time I reached the region I heard that all tickets for the Chateau de Vauvenargues were completely sold out through September 27, when the doors will be closed forever. Evidently locals and French art lovers had snapped them up within days of their being offered. A promised ticket sale through the Internet never happened. No phone sales! Come with me on this trip! Sold out! I love a challenge. I was determined to visit the chateau. In Aix, I went straight to the Musee Granet, and was directed from there to a ticket office, where I discovered that a few same-day and timed tickets might occasionally become available. A helpful young woman there suggested that I return to the office the following morning before 8am to try my luck. I am not an early morning person, but I was there, fourth in line, at 7.30am. Eventually the office workers turned up, tallies were made, and I was ushered into the ticket office. One ticket for 1.30pm that day was available. As it happened, I had a booking to see the Picasso/Cezanne show at 10.30am. Then (at each step there seemed to be one more obstacle) I was told that it was obligatory (a favorite French expression) to go to the chateau by shuttle, and that I must arrive to catch the shuttle one hour prior. And, the shuttle stop was on the outside of town. I arranged a taxi, got to the shuttle at 12.30pm, showed my ticket, and headed out to the chateau through the forests and hillsides. I was ecstatic. After a sunny wander through the town of Vaugenargues, I arrived for my rendezvous at the castle. It was as if all the angst had never happened. It’s a noble and dramatic site. The ramparted castle, with turrets and impenetrable stone walls, stands foursquare among pines, with the mountain rising up as canvas. It had been owned by the Counts of Provence and the Bishops of Aix, and had passed down from one noble family to another over the centuries until 1959 when Picasso acquired it. We walked up the steep winding driveway, entered the domain, and with the grand portals ahead, were suddenly and unexpectedly confronted by the ivy-covered circular parterre that is Picasso’s grave. It’s a place to pause. There’s no marker. It seems oddly understated in this grandiloquent setting. God Bless Picasso. 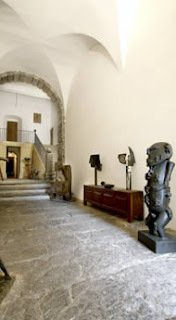 The stone-floored entry, encircled with bronze sculptures by Picasso, still feels like a fortress, with massive doors. And in the enclosed central courtyard, flowers are still laid out in Picasso’s honor. From the guardroom and first glance, it’s immediately apparent that Jacqueline Roque (who was said to have died of a broken heart after Picasso’s death) and her daughter, Catherine Hutin, made a point not to move anything from Picasso’s time. 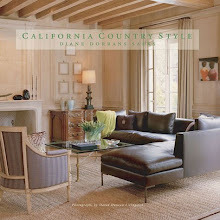 The same furniture is there. His studio is till intact, with his desks, his paints, easels and chairs arrayed around. The experience here is that of a private visit. There are just a handful of people in the group, and as we walk through the silent chateau, all are involved, obsessed and observant. 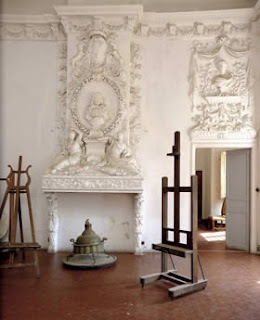 Hushed, we gaze at the rococo plasterwork, the tilting terra cotta tommette floors, the mismatched chairs placed here and there. 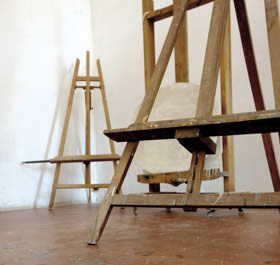 An easel stands mute. Light filters in through iron-framed windows. 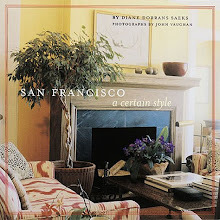 A sense of history, of time passing, of the artist’s presence permeates the air. It is as if the master might be painting in another room. We walk up the massive baroque stairway. In the dining room is the boldly scaled Henri II black sideboard whose bulky façade served as a backdrop for many paintings of this period. Picasso’s little double bed, with its red and yellow headboard (homage to the Spanish flag) is rather austere in the high-ceilinged room overlooking the forest. Adjacent, the bathroom has a mural of frolicking fauns, Picasso’s playful decoration. The white-walled studio is the place of power, with its intact elaborate plaster cartouches and provocative nymphs. The baroque splendor seems at odds with Picasso’s communist sympathies. Sunlight pours in to illuminate the artist’s realm. 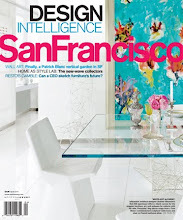 Splashes of paint speckle the floor. Pots of industrial paint, boxes and tins of brushes, stacks of books and a clutter of spatulas are as he left them. Toward the end of the visit, we enter a study and perch on old church pews to view a Picasso family home movie made in the sixties by Jacqueline. Paloma and Catherine, dressed in the style of a young Brigitte Bardot, pose on the lawn. Picasso mugs at the front door. Famous visitors arrive in flashy sportscars. Picasso the Great stomps around in an old bathrobe and slippers. Jacqueline looks coquettish. Picasso poses with clusters of paintings in progress. Life with the Picassos was sweet, and all about Picasso! The visit lasts almost two hours. Knowing that a return visit would not be possible, I wanted to linger. Slowly I made my way down the great staircase recording everything. (No cameras allowed.) A rope dangles, its chandelier missing. 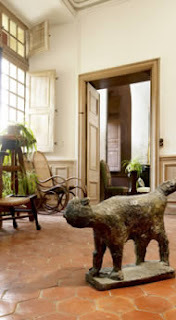 A bronze sculpture of a pouncing cat stands unobtrusively in a corner. This had been one of the more remarkable chateau visits, un-commercial, pensive, revealing, and privileged. It has been especially intense, thanks to the difficulty of gaining tickets and access. I walk into the garden. I take another look at the burial parterre, and bid adieu to Picasso. 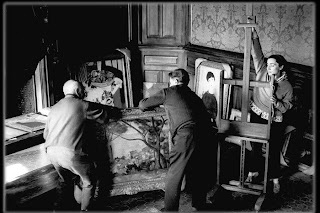 More than one hundred art works (70 by Picasso, 30 by Cezanne) are from private collections and galleries around the world. The concept was to demonstrate the major influence had on contemporary art, and particularly on Picasso. As a visitor walks from room to room, the artists’ biographies and experimentation with new ideas are clearly revealed. 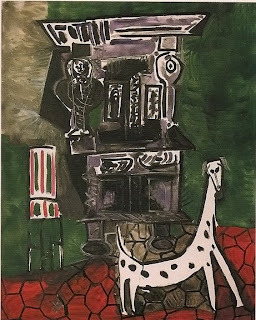 The most exciting aspects of the show are paintings (from the private collection of the Picasso family, and in particular Catherine Hutin) that have never been exhibited before. To walk into a gallery and to be confronted with the large-scale ‘Jacqueline assise dans un fauteuil’ (1964), in all its complexity and inventiveness, is to encounter for the first time Picasso’s mastery of color, line, form, the portrait. The charming ‘Jacqueline et ses fillettes' (1960), painted at the chateau, depicts the artist’s wife, her daughter, Catherine, and Picasso’s daughter, Paloma, in a pink checked dress. The Chateau de Vauvenargues is an inspiring adventure—for art lovers, castle collectors, and Picasso fans. 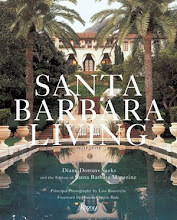 Getting there for a private visit to viewing the interiors is a challenge—and I encourage optimism at every step! For access to Chateau de Vauvenargues: Group visits only, no individual visits. Advance booking is essential. As detailed above, tickets to Picasso’s chateau are officially completely sold out through September 27. Tickets that may randomly be available are timed and for same-day use only. I recommend first a visit to the check-in point at the Musee Granet at place Saint-Jean de Malte (which is showing the superb Cezanne Picasso exhibit). An assistant will give directions to the ‘billetterie’ (ticket office), which is about 2 blocks away on rue Cardinale. Those wishing to try their luck for a prized ticket are directed to return the following morning before 8am (I recommend 7.30am) in hopes that there may be one ticket (7.70 euro). Note that there is no on-line booking. It is strictly in-person. It is then necessary to head to the Bons Dieux parking lot to catch the timed and obligatory shuttle to the chateau. Once you are on the shuttle, the pleasure kicks in. Ten minutes drive through the Provencal countryside, and the shuttle arrives at the town of Vauvenargues, a sweet spot that seems to have been by-passed by tourists and the commercial world. A pleasant walk through the town—the noble chateau rears into view across the valley—takes visitors to the portals of the chateau where the timed 16-person group assembles. For non-Francophones (the minority) audioguides in English are available. No cameras allowed. 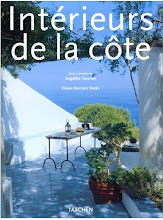 The tour, which lasts more than one-and-a-half hours, is exceptionally well organized and includes a 7-minute and charming ‘home movie’ made by Jacqueline Roque , never before shown. Good luck! Let me know if you were lucky. Photography and paintings: The black and white portrait of Picasso is the cover of Picasso: Mosqueteros by John Richardson (published by Rizzoli) , which focuses on the late works of Picasso. (Exhibit at Gagosian Gallery, New York, March-June 2009.) 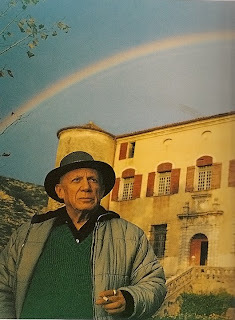 The portrait of Picasso at the chateau, with a rainbow, was shot by David Douglas Duncan. 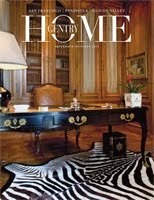 Interiors: Claude Germain/Imageart. Oil paintings by Picasso are copyright, Succession Picasso 2009. Diane, I hope this doesn't turn up twice; I lost my connection while I was commenting. Anyway, the gist of it was to thank you for sharing your marvelous adventure at Picasso's place. Lucky you -- and lucky us! 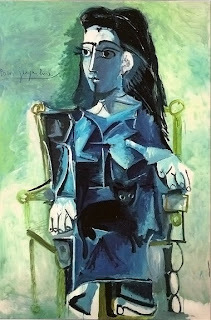 I love Picasso, and his work is still startling today. Excepting our technology, of course, his turbulent world is still very much like our own. There are so many facets and aspects of humanity, like a cubist painting. Peace, kitty. Thank you so much! This was like a mini-Art History lesson. Incredible. Loved hearing your quick responses. The Chateau de Vauvenargues visit was a great adventure. The Picasso/Cezanne exhibit is superbly curated for utmost clarity. I was so fortunate to see them both. What a glorious tour...and a glorious post! Of course being able to visit the chateau in person would be wonderful, but your vivid descriptions make me feel as though I was standing right there next to you on the tour! Dear Vicki-You live in Provence and you know the seemingly impossible ticket situation--sold out.But if you persist and have determination and optimism, you can score a ticket. I was incredibly fortunate. I hope you can do it--it is an adventure! Anyone who secures a ticket is lucky. 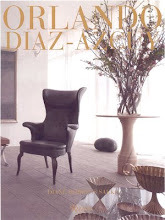 Catherine Hutin agreed to open the chateau because of the Cezanne/Picasso show in Aix. Now, the portal will close. To see Picasso's grave...amazing. Jennifer-thank you. 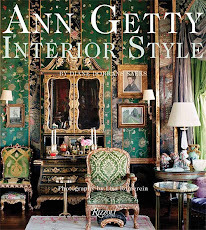 Yes, once inside the chateau, the smell of ancient stone, dust, and a sense of its military past, the centuries of history, the artist's lair, was very powerful. Little Augury: Thank you. I'm now reading 'Life with Picasso' by Francoise Gilot for a future post. I learned a lot about Jacqueline Roque, the last wife, in Aix and also in Vallauris, where he met her when her was creating pottery in the town. I was told that Jacqueline was very chic, spoke several languages, but always put Picasso first, the 'perfect artist's wife' but far from a doormat. 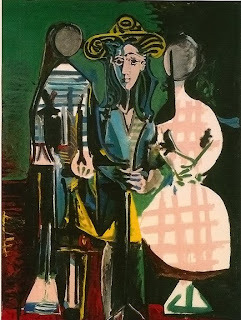 To see his painting of her in the show (blue dress, in chair, on my post, never shown before) and balance his life, and see Picasso and Jacqueline without the misogyny that often clouds biographies of artists was a privilege. Aix--I must tell you it is the most elegant city, with a strong sense of culture, architecture, history, and elegance. Loved it. I've always been fascinated by the chateaus of Aix-en-Provence - now to find that Picasso painted in one of them is tempting... I wish I could go and spend the time meandering through his life. 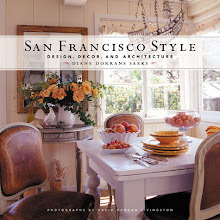 It seems dogmatic to call it fairytale-like but that is exactly what that setting is. Adventurous you! it was quite an achievement getting the ticket and I admire your tenacity. Yes, the chateaux--and history of the region--are overshadowed by the Ile-de-France and history centered on Paris. Too bad. Just think, artists, popes, kings, emperors, feuds, religious wars and retributions and pillaging. And how-here is Picasso in his 13th century chateau--it was especially wonderful because it has never been written about, has never been the feature of a magazine story--let alone a blog! 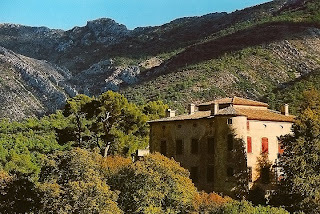 This may be the first blog about the Chateau de Vauvenargues. Lynne-Thank you for your comment. You would have loved the interior, which today has a sense the Picasso is somewhere around (well, he is, but underground)...so much of the chateau suggested soldiers in the 13th century, barons and counts and nobles in later centuries, and then Picasso moved in with Jacqueline. At Versailles and other thrilling chateaux, there is little sense of life. They are museums. Vauvenargues is a private residence, lived in, superbly maintained. And to see Catherine Hutin's private Picasso paintings inherited from her mother was moving.It's a great lesson in seeing with 'beginner's mind'. Fascinating tale! What an adventure. I think of this - I remember reading that Picasso was terrified of dying. He just refused to admit he was going to go even in his 90s. So to read about his grave and know that alas, he did leave, makes me sad for him. What a legend and what a man. Yes, Picasso was superstitious about death. His creativity and voracious work were his assurance of immortality. 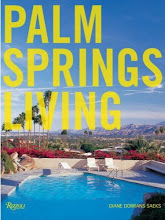 In his lifetime, and especially is life as an artist, he created over 60.000 major works over around 65 years or so. 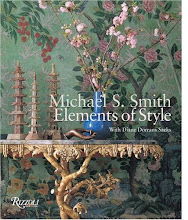 He lived many lifetimes with many wives and talented women artists, dancers, soul-mates. I had a sense of all this at the chateau. It's a vivid experience. It was a great day for me. I went to the Chateau, the Cezanne/Picasso exhibit and the Cezanne studio all in one day. 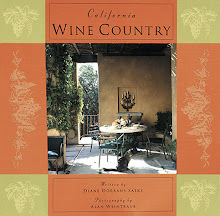 For me, as a painter,and as the daughter of 2 artists that knew him well, it meant so very much. Mougins did not give the permission to bury Picasso there at the villa, so his wife and oldest son took him under cloak and dagger silence, to Vauvenargues to be buried there. The bureaucrats there were more reasonable to the request and he was buried at the front of the Chateau after the ground had finally thawed after a freak snow storm in April. Thank you sharing your tour of this gorgeous chateau with us! It's well worth a visit on it's own, but the Picasso legacy makes it all the more enticing. It's so interesting to me that his grave is relatively unmarked, although I find that oddly comforting. 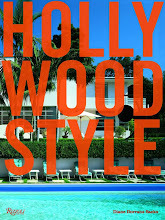 I hate that, for many people, his name is synonymous with art they "don't get". It's too easy to forget about Picasso the person. Right now, the wall closest to me has a print from his "face of peace" series. Made me smile.